You can do this yourself, saving money and ensuring you know what is in each box and safe in the knowledge that when removal day arrives you are ready. You can also ask your remover to quote for this. If you pack yourself it is absolutely essential that you use the remover’s own boxes. They will normally lend you moving boxes free. They will know how many you will need of each type and will collect them a week later once you have unpacked. The removers own boxes will be sized so that heavy items such as books or plates go in the smaller boxes and lighter items in the larger boxes. All of the boxes will be modular sized so that they can be stacked in uniformed levels in the lorry without wasting space and reduce the chance the boxes will fall during transportation. Always try to fill the boxes completely so they can be stacked on top of each other. Another golden rule is never make the boxes so heavy they cannot be lifted easily. Top up heavy boxes with light items such as cushions and pillows. A good moving tip is to make a packing list as you go so you know exactly where everything has been packed up. Always use strong tape such as parcel tape on the top and bottom along the joining flaps and across each end. Some removers will also supply suitable tape with their boxes. Never just fold the flaps criss-cross style. Colour code and/or write on the packing boxes which room the box is for so the remover will know what goes where in your new home. 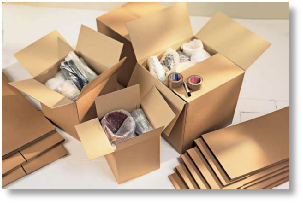 It may be also useful to you, when unpacking, to have a list of the box contents taped to the box. The best rooms to start are those used less frequently. Pack the things you are certain you will not need before the day of the move first. Begin at the top with the loft. Garages and sheds next and so on. Once a room is packed, the boxes from other rooms can be stored there as well so you are not living with too many boxes until moving day. Start to carry out the Change of Address checklist. Notify everyone on the list of your moving date and new address. Visit and inspect your new home and make sure it will be fully completed before moving day. The last thing you will need is tradesmen running in and out finishing snagging when you are moving in. Do your last laundry wash before the washing machine is disconnected. Remember to re fit the travel brackets that came with the machine to secure the drum. Collect any items from dry cleaners. Pack an emergency box with certain tools, light bulbs, fuses, loo rolls, screws etc. Pack a change of clothes and an overnight bag of toiletries. If you are taking any garden plants dig them up, pot them and put them somewhere dry like a garage or conservatory. Return any library books you have. Disconnect the fridge freezer and defrost. Leave the door open until the last minute. Take pets to the cattery or kennels. Disconnect any gas appliances that you are taking. You will need a Gas Safe registered plumber for this. Put together a basic catering pack, kettle, tea, coffee, sugar, milk, biscuits, canned drinks, fruit and mugs and take this with you. You may need this straight away in your new home! Take young children to friends or family. Promise older children a reward or treat for helping and good behaviour. Offer the removal men a hot drink when they arrive and keep them coming. Give the removal men clear directions to your new home. The postcode and a copy of the sales brochure directions/map with the development name would be ideal. If they are likely to get there first, warn them it may not be possible to start unloading until you have completed the house builder’s hand over procedure. It may also be useful to exchange mobile phone numbers. Remember to take final meter readings from your old house before you leave. Keep valuable items and documents with you, not the removal lorry. Take one last look around your old home before you leave and look in wardrobes and cupboards. Take the keys to your estate agent or your buyer. Good removal companies are well aware how stressful moving can be - after all you are trusting them with all your possessions! Many people find that they have less storage space in a new build home and that Self Storage may be an answer. You can now store anything from a few boxes to the contents of a whole house. As a rough guide you will need about 75 square feet of storage for the average contents of a one bedroom house. After this it works out at approximately 50 square feet per bedroom.